Our journey across northern Spain brought us to the region of Asturias. This place may be the cleanest city in Europe. That's right, cleaner than cities in Switzerland, Germany etc. Woody Allen, noted germaphobe, was quoted about Oviedo, (2nd largest city in the Asturian region, and the location for many scenes in Allen's film, Vicki Christina Barcelona), "Oviedo is Delicious, Exotic, Beautiful, Clean, Pleasant, Peaceful, and Kind to Pedestrians. It's as if it doesn't belong to this world, as if it could not possibly exist...Oviedo is like a Fairy Tale." Oviedo is also one of the friendliest cities we have ever visited. When you add incredible regional food, Asturias is a treasure you need to visit. 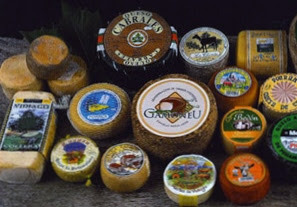 The cuisine of Asturias is based on Fabada, Cheese, Cider, and of course fish and shellfish. The food is rustic and natural with little or no spices. Fabada Asturiana or just Fabada- is a heavy rich bean stew, made with white/faba beans with pork or bacon, chorizo, and morcilla - black sausages...hmmmm Happy Boy! ...the local dish is so loved - stores are full of take-home packets. We went to a couple of restaurants to taste the different variations - all were excellent and left us tooting for more! Chorizo and blood sausage crumbled and spread on tortillas works well with Sidra! We chose El Burladero restaurant because we liked the vibe!